After his retirement as Group Chairman and subsequently being able to ease up on the ‘Masonic throttle’ it was a very relaxed Jim Wilson who delighted the brethren and guests of Garstang Lodge No 6633 when he attended as the representative of the Provincial Grand Master at their installation meeting held at Wyrebank, Garstang. Pictured from left to right, are: Jim Wilson, Colin Richmond, Bill Williamson and Chris Butterfield. Jim was accompanied by fellow grand officer Chris Butterfield, group vice chairman Scott Devine and Provincial acting officers Gordon Smith, Les Newlands and Graham Dowling. Master elect Colin Richmond was presented for installation by Mike Fleet, before installing master William (Bill) Williamson delighted everyone by placing Colin in the chair of the lodge, in a most sincere and accomplished ceremony. The address to the master was superbly rendered by Bob Tinsley, as was the address to the wardens by Graham Davies, whilst Jim Wilson gave the important address to the brethren with accomplished sincerity and gravitas. However, it was the explanations of the working tools of the three Craft degrees which proved a really interesting highlight of the afternoon’s proceedings. 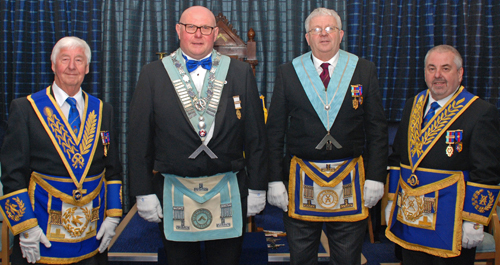 The three lodge brethren earmarked to deliver the explanations were unfortunately unable to be present so the lodge turned to three ‘special imports’ from other local lodges to fill the void. These were ‘light blue’ brethren who have not as yet reached the chair of their lodges, but who, after just one rehearsal, gave absolutely faultless and confident performances, which brought great credit to themselves and their respective lodges. The working tools of a master Mason were presented by David Partington of Pilling Lodge No 7879, those of a fellow craft by James Hughes of St Michaels-on-Wyre Lodge No 8348 and the working tools of an entered apprentice were explained by Chris Wilkinson of Pilling Lodge after which great and spontaneous acclaim was expressed by all the assembled brethren. 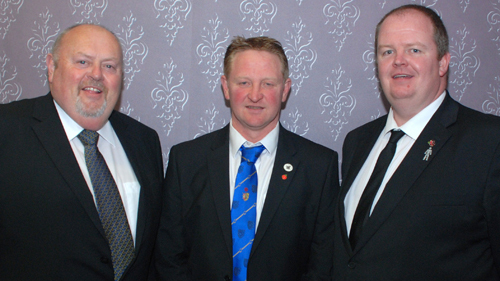 The three ‘special imports’ – the brethren who so superbly gave explanations of the Masonic working tools: from left to right: David Partington, Chris Wilkinson and James Hughes. At the closing of the formal ceremony of installation, Jim Wilson was swift to rise and bring to the new WM and brethren the very best wishes of the Provincial Grand Master Tony Harrison. He would, Jim said, have been very proud to have witnessed such an excellent ceremony and would undoubtedly have wished to congratulate not only the new master of the lodge but also the immediate past and installing master for his work, both on the day and throughout his year of office. On behalf of the PrGM Jim wished all the officers and brethren of the lodge the very best of health to enjoy the coming year to the full, which he sincerely hoped would be a happy and enjoyable one. Just before he resumed his seat Jim was presented with a list of donations made by the lodge to charitable and good causes totalling more than £2,000. These included £500 to the MCF 2021 Festival, £200 to the Garstang School of Gymnastics, £120 to Freckleton Brass Band, £750 to the Wyrebank Refurbishment Fund, £100 to Garstang Masonic Fellowship and £100 to the Masonic sporting societies. The ‘Bear Necessities’: the prize draw won by Harry Clapp. Some 80 brethren enjoyed the banquet at the Festival of St John, which was held in the magnificent Wyrebank Banqueting Suite, when Jim, responding to the toast to the health of the grand officers, was delighted to be able to offer his own congratulations to Colin on reaching the chair of the lodge – something which he said gave him great personal pleasure having known Colin for many years. He also congratulated all the brethren who had taken office and all those who had contributed to making the occasion such an excellent one particularly, of course, the three brethren who so superbly explained the working tools. Jim took the opportunity to apprise the brethren on a number of issues which the PrGM deems of particular importance, including the MCF 2021 Festival, the Royal Arch, charitable giving and membership in general. The master’s song was very professionally performed by local Freemason Bob Tinsley, accompanied by David Tattersall. The evening’s raffle raised the superb sum of £416, which was followed by the group’s ‘Bear Necessities Draw’. 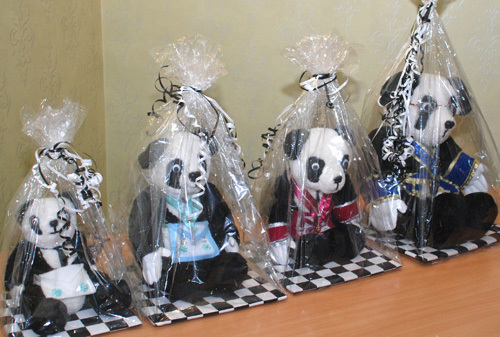 This was for a prize of four bespoke cuddly bears, adorned in Masonic regalia and hand-made by Karan, the wife of group vice chairman Scott Devine. Tickets for the draw had been on sale for a number of months and had raised the sum of £1,300 for the MCF 2021 Festival. The winner of the draw was Harry Clapp of Longridge Lodge No 8077.